The YouTube Channel Engagement App allows Page Admins to easily customize a image based tab. This App is available at Platinum and above Plans. Ability to enter your full Channel or to choose a specific Playlist you have created. Upon entering your Channel ID, we pull in your Playlists and populate a dropdown of them for you to select from. The first or selected video is at large size and play right on the tab. 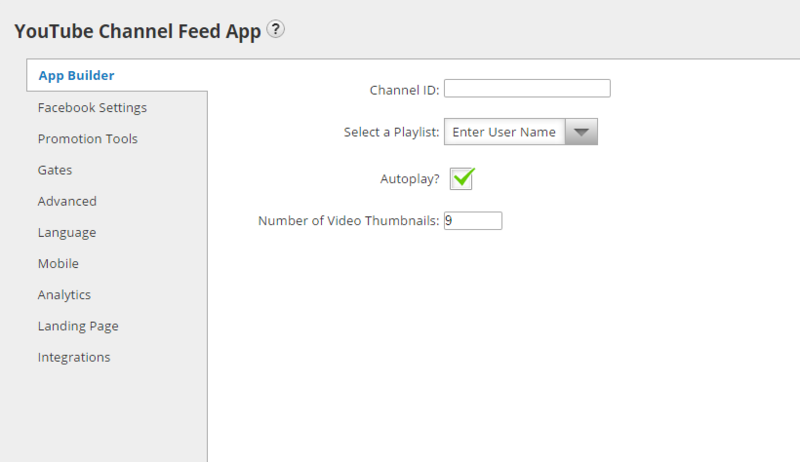 Admins can set how many videos from a Playlist will be part of the thumbnails slider area. Users can simply click the arrows to advance through your videos and select the one they want to watch. Populate for users and control your brand social sharing message by adding core information for the Share button, Pinterest Pin, +1 and Tweet to strengthen the message from your Page that goes out when fans share the information. The Like, Share, and +1 pull from the Title, Description, and Image fields, and the Tweet text has a counter to help you stay within a 140 character limit. Ability to have a "Form Gate" so that users must sign-up to get access to your videos. Make sure you are in the Manager section and then click on the tab called Add App. Scroll down the page and stop at the Photo & Video Apps section. Search for the YouTube Feed App and click the Add+ button. You will be directed to the App Builder page after you click the Add+ button. 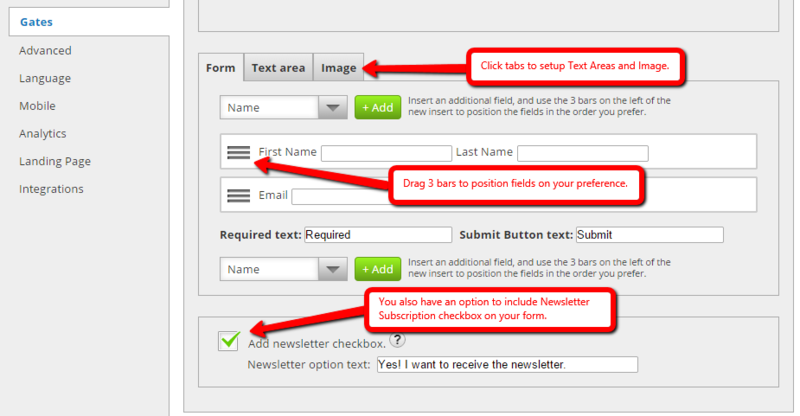 In this page, you will be required to enter your Channel ID and choose an existing playlist from the drop-down menu. Also, you can sort videos by its Published Date, Relevance, View Count, Rating and Default. To get your Channel ID, go to YouTube and once logged in, click on the My Channel in the menu. Then in your browser URL your ID will be after the youtube.com/channel/thisisyourID. You can choose to enable the autoplay feature of the playlist as well as set the number of video thumbnails on the page. Publish your tab to Facebook with the help of the Facebook Settings. Simply specify your tab name, tab logo and tab icon. For your logo, it is suggested to upload a 111 by 74 pixel image in any of these formats: jpg, png or gif. The third one in the settings list is the Promotion Tools. It is comprised of four sub-settings specifically Social Sharing Options, Blog/Web Call-out Tool, Post Planning and Comment System. Prepare your app for social sharing through the help of the Social Sharing Options. Tick the check boxes of the social media sites you would like your tab to display. Also, assign the position of your tab either on top, bottom or both with the social networks you are connecting it with. Modify the title and description in Facebook and Google+ as well as pre-set your tweet in Twitter. Try to be strategic in both your title and description in addition to your share image. The Blog/Web Call-out Tool enables your fan page generate tons of traffic with the use of a promotional call-out. All you have to do is upload first an image and then, we will provide you an embed code you can use to post the call-out image to your own blog or to other websites. When visitors click this image, they will be directed to your Facebook tab. Note: This feature is available to Platinum level users only. Use the Post Planning sub-setting to schedule your posts and publish them to social networking sites. We offer three scheduling services to be exact Sendible, Hootsuite and Buffer to do this job. We use SMART URL for posting since it is mobile and PC-friendly. It forwards you to your created tab on Facebook. See to it that before clicking one of these services, better save the page FIRST! The Comment System lets you customize the options for your comments. Click the "Enable Comment System" first to reveal the other options below. The first of the additional options is "Allow visitors to sign-in to comment via" in which it lets us sign-in to either Facebook or a Form before we can post a comment. The second one is "Comment Notification Emails" wherein we can key in on the empty field beside it the email addresses of users we would like to alert when a new comment is posted. The "Require comment approval" check box enables us to have the authority of approving/rejecting all the comments your visitors are posting. Finally, manage your comments using a gray button with this name located underneath the page. The Advanced setting enables you to upload a 810 x 75 pixel image for your Header Image, modify the link color, text color and background as well as customize your app's CSS. A color selection tool shows up when we change the options in the Styles tab. The default styles for the CSS of your app are already provided. The Language section has two sub-settings; General and Comment System. The General sub-setting enables you to modify the kind of language you would like to use for your Like and Tweet button. These lists of languages can be seen from the "Like button language" and "Tweet button language" drop-down menus. You can modify your Share button text as well. Simply replace the text on the field with your desired version. The Comment System is comprised of two sub-settings; Comment System Language Settings and Errors. All you need to do in here is to customize all the default texts written beside the descriptions and change it all to your preferred version. The next setting is Mobile. There are two Global Options for this setting: the "Render desktop version on mobile" and the "Use like gate on mobile devices". The first one allows mobile users to use the app’s mobile-friendly alternative version on their mobile devices. Meanwhile, the second one enables the usage of the fan gating feature of the Like Gate image to mobile users. 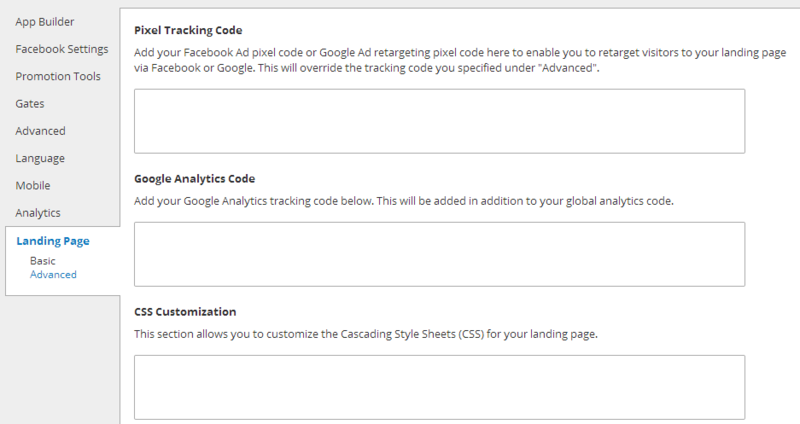 The Analytics setting is the last one in the line. It determines the amount of traffic that is entering in your app and where exactly it is coming from. 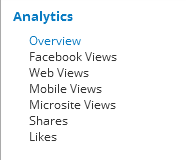 The graphs comprising this setting are the following: Overview, Facebook Views, Web Views, Mobile Views, Microsite Views, Shares and Likes. Don’t forget to click the “Save” button after you have done doing all the changes. Upon ticking the “Save” button; the page will lead you to the My Apps tab. You will see in this area all the apps you have added. You are able to add another app, test it and finally, publish it in accordance with the features of your Plan. Tick the “Publish” button to go through the process of placing the app to your blog, website or in Facebook.